The randomness that is the Woot Plus Camera sales added a handful of lenses for sale. AS of the time of writing, they are all sold out except for the new condition Olympus 25mm f1.8 [m43] going for $165 with a 90-day Woot warranty. Free S&H for Prime members or $5 flat. Limit up to three lenses per customer at the sale price. The action continues at the Olympus Outlet Store with items going in and out of stock. On the in-stock side of things, the manufacturer refurbished Olympus M.Zuiko Digital ED 40-150mm f4.0-5.6 R is back in-stock for $60 plus $5 flat shipping. Shipping is free with orders of $100+. It is in-stock again as of the time of writing. 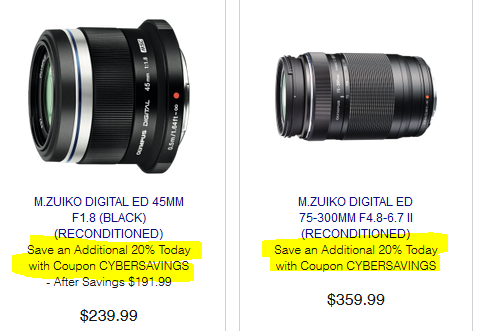 The new condition Olympus M.Zuiko 40-150mm f4.0-5.6 R can go as low as $100 when on sale, but if you want to save more, you can right now get the manufacturer refurbished version in silver for $60 plus $5 flat shipping at the refilled Olympus Outlet store. Already the black color scheme sold out since the morning. Shipping is free if your order total is $100+. It comes with a 90-day Olympus USA warranty. The silver is in-stock as of the time of writing. 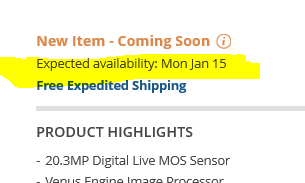 I just added the upcoming Panasonic G9 to the Stock Status Tracker, and surprise-surprise, both the Amazon itself listing and the B&H Photo listing have a January 15 estimate! The original Panasonic estimate was for late February. So if two major retailers have the same estimate, that’s a good sign! The factory reconditioned Olympus ED 75-300mm F4.8-6.7 II lens goes for $360 with free shipping and a 90-day Olympus USA warranty from their Outlet store. It is in-stock as of the time of writing. The coupon is a limited time offer. In new condition at authorized Olympus dealers, this lens goes for $474, eg Adorama and B&H Photo.